Adrian Broca is one of the fastest visually impaired marathon runners in the United States with a personal best of 2:50:37. He is one of only three current blind American runners to break the 3-hour mark for the 26.2 mile distance. He is one of only a handful of visually impaired triathletes to complete the full Ironman distance. A high school cross-country runner, Broca was diagnosed with Leber’s Optic Neuropathy at the age of eighteen. LHON, an inherited form of vision loss, causes atrophy of the optic nerve. After struggling with depression for several years, Broca finally took steps toward regaining all that he had lost along with his vision. His first courageous strides were taken in his running shoes with his sister Jenny acting as his first guide on short neighborhood runs. 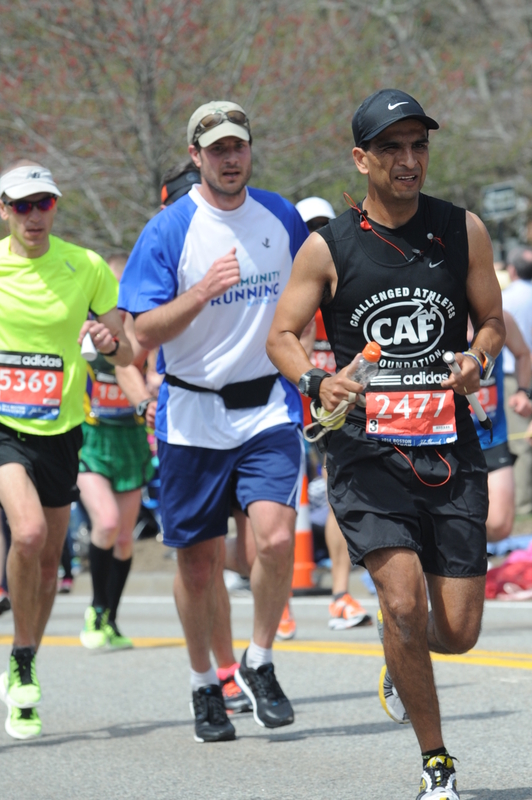 Within a few months, Broca ran his first Los Angeles Marathon, unguided. By following the blurry shapes of runners ahead of him, he managed to finish in a respectable time of 3:42. Unaware that running guides existed, Broca completed five subsequent marathons by using the same tactic. Despite improving his times, Broca was frustrated by missing water stations and turns on the course. In 2004, he ran his first unofficial sub-3 hour marathon when he mistakenly missed a turn and cut short the course of the Long Beach Marathon by almost half mile. The humor of the situation was not lost on Broca when he found himself walking on grass and listening for spectators as he tried to navigate his way back to the marked course. A year later Broca’s path as a runner profoundly changed when an athlete from the Los Angeles Road Runners volunteered to guide him along the route of the Los Angeles Marathon. He also found enthusiastic support in the Executive Producer of the live broadcast who provided him with spotters that acted as cyclist guides. This race proved to be a milestone in Broca’s running career in more ways than one. Feeling completely unrestrained and overconfident, he failed to pace himself and literally crashed at Mile 20. After tripping on his own weary feet, Broca found himself laying in the middle of the road. Undeterred, he took a moment to regroup then picked himself up and continued on to the finish line. Broca’s athletic pursuits have shaped his character and taught him to bring the courage and confidence he feels on the course into his everyday life. He has formed life-long friendships with his running and triathlon guides across the country. Their generosity serves as an important reminder of the kindness and depth of the human spirit.